I recently journeyed to Palermo in seek of the honest truth about a legendary, little-old-lady run Mexican joint named La Cupertina, which supposedly once put out some of the best empanadas, humitas, locro (meat and corn stew). The rumors, sadly, are true. It is, in fact, closed and in place of the authentic little 12-peso-a-bowl joint is yet another minimalist-chic, candle-lit, boutique dining room to match the horde of other identical venues that line Cabrera. My friend and I wanted some form of comfort food, however, and we were not going to settle for anything less than homey. 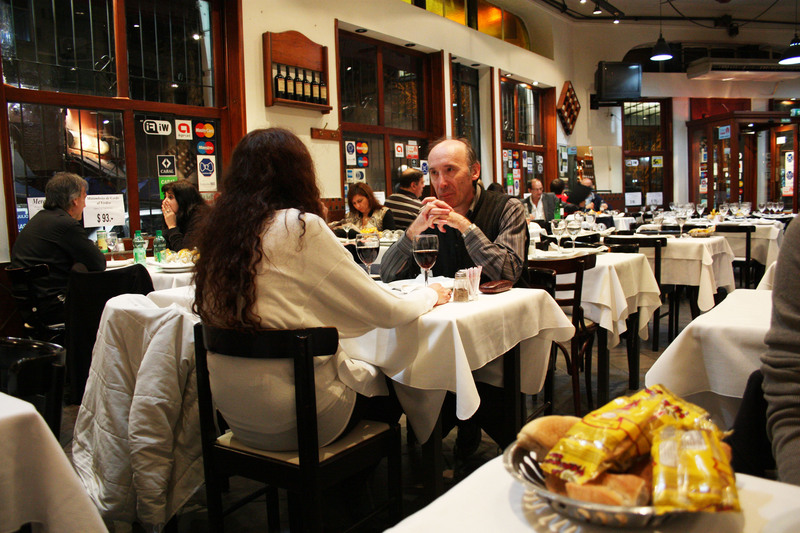 As we were walking through the maze of Palermo tourist-traps, she suddenly recalled a review she had read about a parilla called “La Trapiche or something” which was not that far away. We decided to go. BoyamIgladwedid. 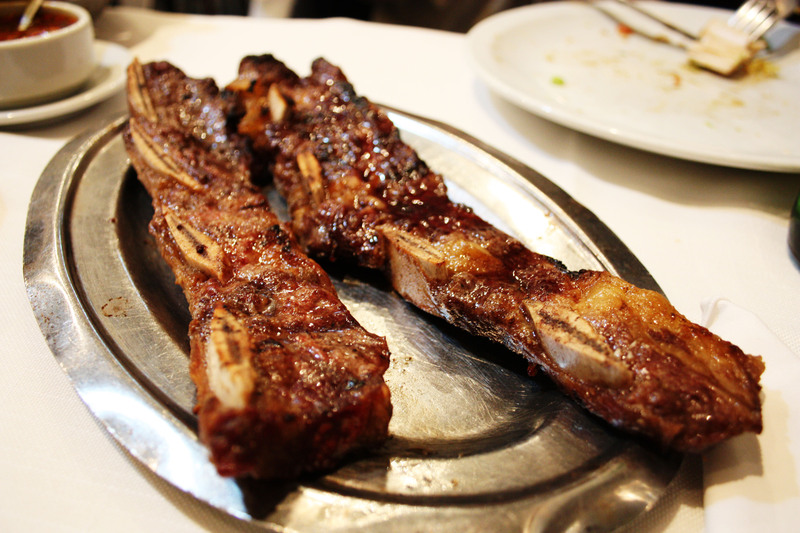 Tiras de Cerdo (2) – Delicious pork short-ribs that were fatty on the sides but deliciously tender and juicy in the middle. The meat was smokey-sweet, and not at all dry (which happens all too often with over-cooked pork). 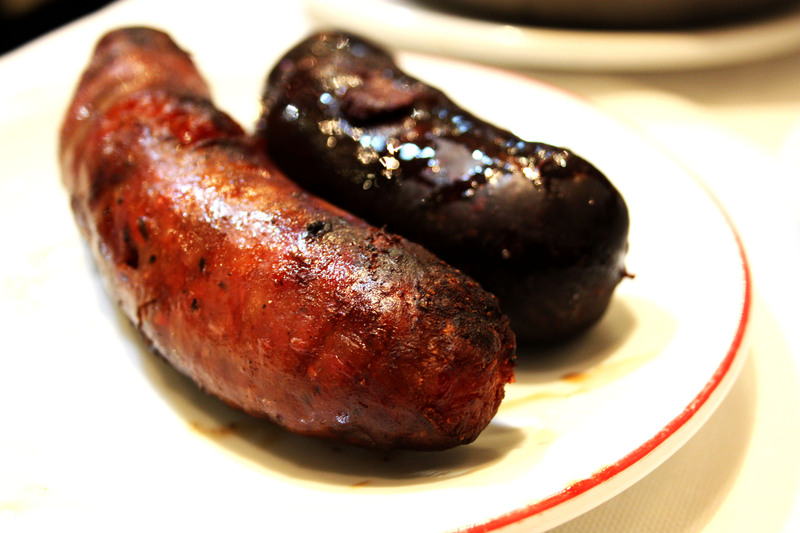 Chorizo – This was probably one of the best sausages (if not THE best) I’ve ever had. The crisp casing was grilled to red-hot perfection, ready to explode when sticked with a fork. The meat inside was beautifully seasoned with smokey red peppers and had a beautiful plump, firm texture to it. It was by no means too greasy, and the bit of excess meat juice that did come off it was soaked up by the complementary bread, dry for this exact role. Morcilla – A line which many do not cross; one which I leap through enthusiastically every chance I get. 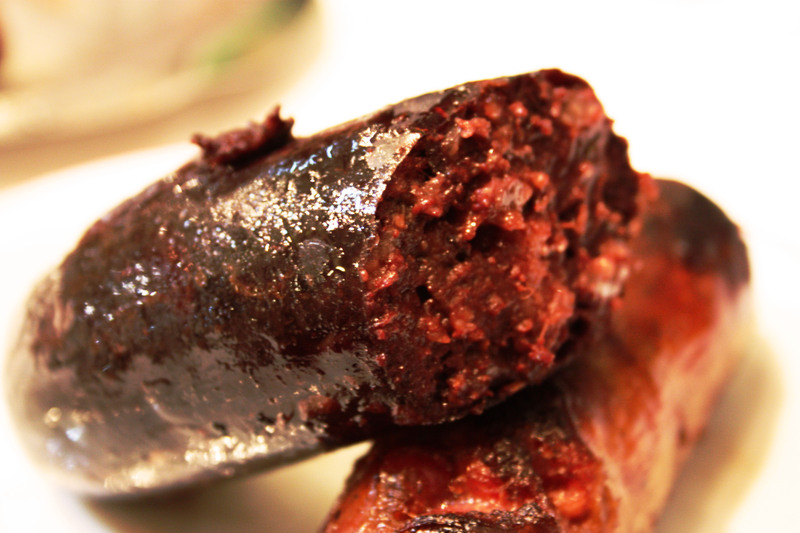 Morcilla is the Latin American equivalent of what the Irish call black pudding, what the Germans have named blutwurst, what is perhaps most commonly known simply as blood sausage. Perhaps the Irish term applies best to this fantastic and crucial element of the typical Argentine asado. While the casing itself is crispy, when poked, a soft, pudding-like meaty pate rolls out onto your fork. 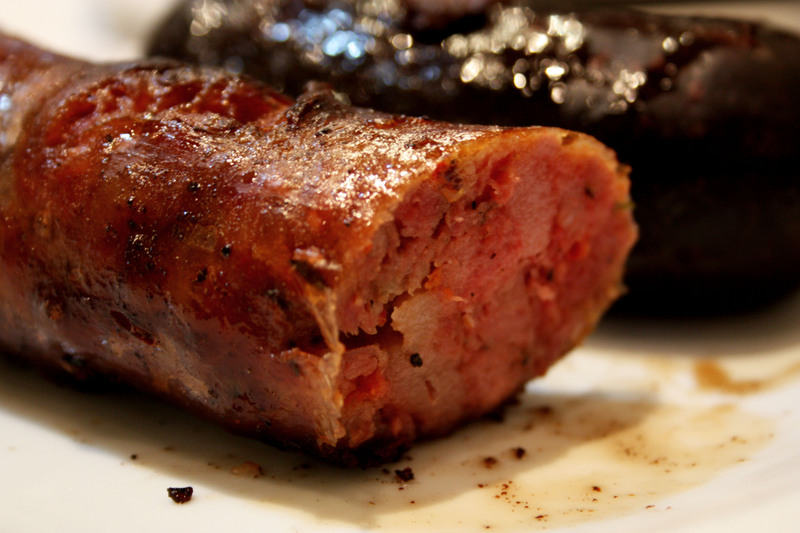 The blood gives the filling and incredibly richness and depth of meaty yet earthy flavor which harmonizes dreamily with the slightly sweet spices (Uruguayans and Argentines tend to prefer the sweet morcilla over the savory one found in most other Latin American countries). Chimichurri – Often not necessary because the meat itself here is so damn flavorful, but great to have on the side anyway. 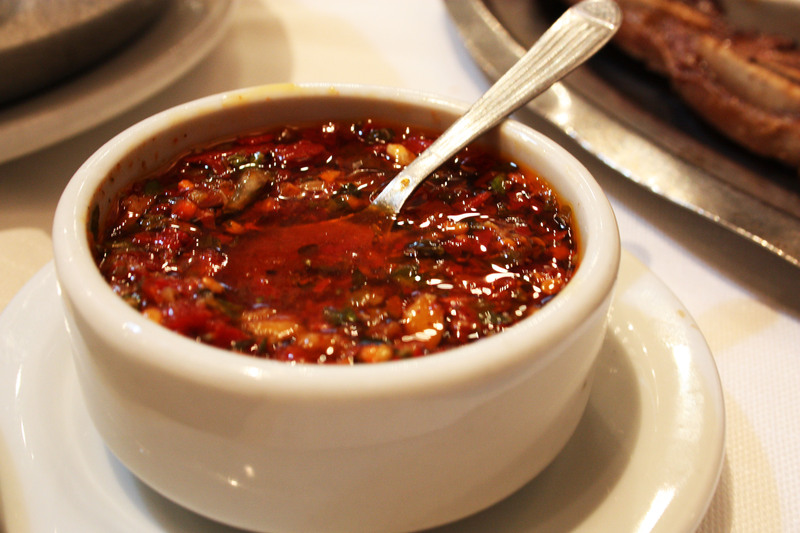 This one was very good, as it had a variety of chiles blended with the parsley and garlic. A bit of red wine vinegar added a fantastic extra kick to it. Yummy on both the ribs and the chorizo but would’ve been way too overpowering on the morcilla. 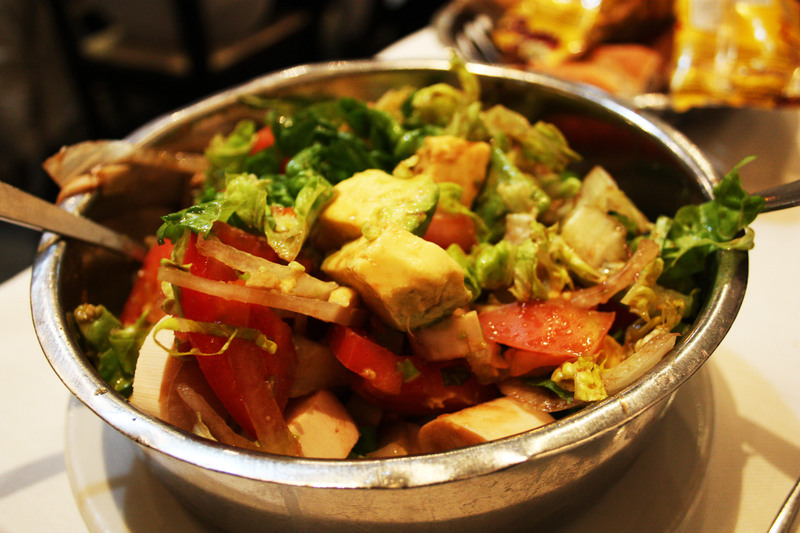 Mixed Salad with Palmitas and Palta- I have quickly become used to the appearance of heart of palm and avocado on every salad list in B.A., and I am a huge fan of this combo. The avocados were beautifully ripe and oily rich, while the heart of palm was crisp yet tender, slightly pickled but not overwhelmingly so. The tomatoes and onions were plump and juicy and the lettuce fresh. A great way for those not yet completely accustomed to the all-protein Argentine diet to start out on their meaty excursion. Helado de Almendrita- Delicious, though I’m not sure if it was house-made. 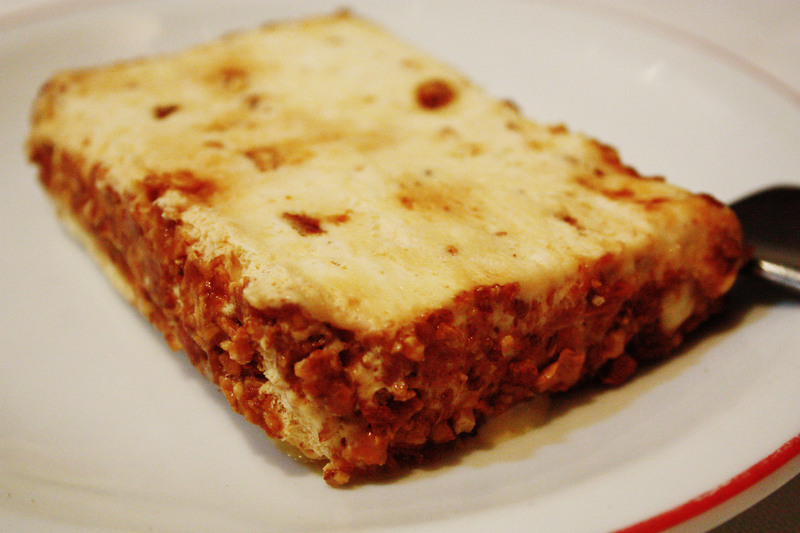 Not-too-sweet rectangle of almond ice cream, creaminess periodically interrupted by chunks of toasted almond, the sides wrapped with sugar-coated almond bits. A yummy finish to the meal.